Our Mini 3-D Maypole craft can be used as a name card or lollipop/candy holder or just a little decoration to go with the rest of our May Day crafts and coloring pages. 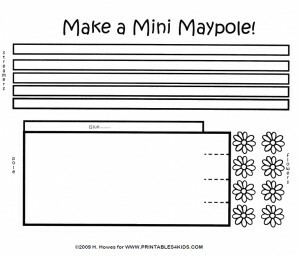 Click on the image above to view and print the pattern full size or download the Mini Maypole 3-D Craft Pattern as a PDF file. Color all pieces. Streamers should be different colors. Daisy centers yellow, petals left white. Cut out the pole. Carefully cut along dotted lines at the bottom of the pole. Place glue along edge of flap and roll toward opposite edge of pole to create a cylinder/tube. Once dry, fold four flaps at the bottom and the pole should stand upright. For extra support attach to a piece of square card stock. Decorate the pole with the streamers hanging from the top and daisies overlapping around the edge. Streamers can be curled with a pencil or wrapped and glued around the pole. Top it off with a lollipop or real flower from the garden! This makes a cute name card/place card, too. Cut small pieces of green constructions paper and make 3-D grass around the base.